This FRP flooring system is non-magnetic and will not interfere with the MRI machines. Access flooring panels were easy to fabricate and lightweight, making installation easy. A 1950s building was being reconstructed into a state-of-the-art research facility at a California university. As part of the renovation, two of the building’s rooms were going to be converted to house MRI machines. The architectural firm needed to find a completely non-magnetic access flooring system for the two rooms. Materials selected for use in these MRI rooms must have non-resonant properties to prevent any interference with the MRI machinery. 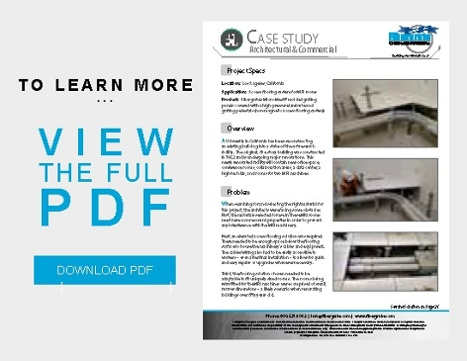 Fibergrate provided a fully non-magnetic access flooring system that addressed all of the project requirements and even provided additional benefits! This non-magnetic, non-conductive flooring system is comprised of Fibergrate’s Micro-Mesh® molded grating panels covered with a high-pressure laminate and grating pedestals. The grating pedestals were used in conjunction with the 2’ x 2’ grating panels to create an elevated floor with plenty of space below to house the cable equipment of the machines. The FRP panels are lightweight, allowing for easy removal when needing to access any of the hidden equipment.